There is nothing in this world quite as peaceful looking as a sleeping baby. No matter stressful your day was when you lay that sweet little baby down for bed, they just look so angelic. Of course, they won’t sleep well at all if you don’t have the right mattress, and you can’t base your decision on comfort alone. No, no, you need to make sure that you have the best breathable crib mattress as well. The very last thing that you want to do is to put your baby in harm’s way by putting them in a sleeping situation that is isn’t safe. A breathable crib is an essential piece to this safe sleeping puzzle. However, it can be tricky to find the right one. Thankfully, you’ve found this article! In this article, I’ll guide you through everything you need to know to get the perfect mattress and give you an in-depth review of the very best mattresses on the market today. Unfortunately, SIDS is a very real threat for parents to combat. Every year, over 2,000 infants die. However, unlike years and years ago when SIDS got its name, many of these deaths can be blamed in part on unsafe sleep situations. To make sure your baby is as safe as possible while they sleep, be sure to stick to the following guidelines. Back Sleeping – Infants should always be placed on their backs when they are in their crib. This prevents them from becoming trapped face down, especially when they are very young. It also helps because it keeps babies from getting into a deep sleep, which sounds counterintuitive. However, my kid’s pediatrician explained that since they don’t sleep deeply on their backs, infants are more likely to wake up if there is an issue. Breathable Crib Mattress – Well, obviously, this is kind of a big one! A breathable crib mattress will allow your little one to breathe even if they roll onto their belly while they are sleeping. No Toys, No Blankets, No Pillows – The only thing that you place in your baby’s crib is your baby. Blankets, pillows, and toys all present a large suffocation risk. Your baby won’t notice that all of these cuddly things are here anyways, especially when they are younger. Swaddle – A swaddle will keep your little one from rolling all about when they are younger. It will help them to sleep more soundly, and remove the need for blankets to keep them warm. Pacifier – A pacifier will help your baby to keep their airways clear and to regulate their breathing. It will also provide them with the soothing that they need to stay asleep. In The Same Room – I know, I know, you’re exhausted! You want to sleep as much and as often as you can, and you just don’t think you can sleep with your baby in the room. Again, that’s the point! If your baby gets into any sort of distress while they are sleeping, you don’t want to be in another room sleeping soundly. Now, it might seem like a tedious task to find the best breathable crib mattress. However, you’ll be glad that you did your homework to find the right one for your baby. Just make sure you keep a couple of key factors in mind when you do go out to get one. Proper Sizing – A properly fitted crib mattress will not have any gaps along its edges. If you purchase a mattress and it does have these gaps, do NOT put your baby in that crib! These gaps are yet another danger you should avoid at all costs, as they could allow your baby to fall into them, become trapped, and unfortunately, suffocate. Firmness – Many of the newer mattresses on the market today have different firmness levels based on which side is being used. The infant side will be a bit firmer, while the toddler side is softer. If you purchase a mattress with dual firmness levels, be sure that you don’t switch between them too early, cause once you go to the softer side, and there is no going back. Buy New – Just like a car seat, a crib mattress should never be bought second hand. You don’t know what type of household a used mattress is coming from. For all you know, there could be majorly disgusting things on that mattress, and I for one, would not want my baby, or any baby for that matter, exposed to anything like that. Foam or Springs? – There are two basic ways that a crib mattress can be made, which either is with springs or with foam. Both of these different crib formats offer breathable options, and both are quite comfortable, with foam being just a bit cushier than springs. Cover Type – You are going to want to make sure that you have some sort of cover on your crib mattress, because, after all, this is for a baby. If you don’t make sure the mattress is covered with a waterproof or water-resistant cover, you’ll have tons of stains in no time. Just make sure that if the cover is 100% waterproof that it has built-in ventilation pockets to keep a breathable mattress completely breathable. The Good: This just might be the best breathable crib mattress on the market today! It is made with your baby’s comfort and safety in mind, as it is 100% breathable. 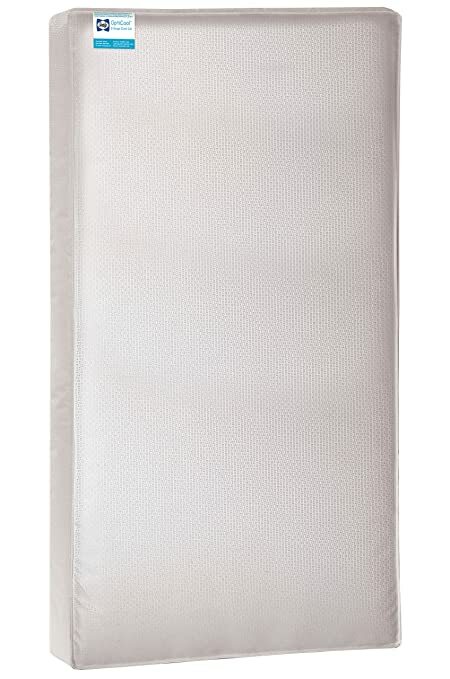 This mattress, which you can view here, is also hypoallergenic, which is perfect for a baby’s sensitive skin. The Wovenaire is also dual sided, having a firm side for infants and a softer side for toddlers. These two sides mean that your kid will be able to get a good night’s rest regardless of their age or developmental stage. Finally, the coolest thing about this mattress is the fact that it is completely washable despite the fact that it isn’t covered in plastic or acrylic. This will help you make sure that your little one is not only safe and secure while they sleep, but germ-free as well. The Bad: Due to its innovative design and safety features, this mattress has a price tag which some families might find a bit prohibitive. You’ll be getting a great product, but if money is tight, then you might be better served looking elsewhere. The Long and Short of It: While the price tag for the Wovenaire is a bit high, you certainly won’t regret getting it. It is washable, hypoallergenic, and completely breathable. The Good: The Little Dreamer is a great mattress because not only is it breathable, but it’s waterproof as well. In fact, this mattress comes with a fabric cover all of its own, which is a big money and time saver. Due to its fabric cover, this mattress is also really easy to clean. All you have to do is simply utilize your favorite dish soap and water and get scrubbing. You’ll be amazed at how quickly and easily you can get out even the most ground in stains. The Bad: While this mattress is listed as having dual sides, both sides are extremely firm, even the toddler side. Now, personally, I never switched my kids’ mattress to the softer, toddler side anyways, and they have always slept really well. The reason I say that is because your child probably won’t even notice that they are on a softer or firmer side. If it is all they know, then it’s all they know. The Long and Short of It: This mattress, which you can check out here, is a nice and firm mattress. It is fully waterproof thanks to the cover which it comes with. The Good: This is another fine choice if you are looking for a lightweight, breathable, and hypoallergenic mattress. The Opticool, which you can see here, is an all-foam mattress, meaning that it doesn’t have any chance to suffer from pointy springs. This mattress is also double sided, allowing you keep your baby and your toddler in absolute comfort and safety. The Bad: While this mattress is really soft, you might have a tough time fitting it into your crib. The corners, which are designed to keep gaps to a minimum, are extra firm, which could make getting it into the crib a bit of a struggle. The Long and Short of It: This foam mattress is really comfortable, lightweight, and breathable. Just make sure you have plenty of time to fit it into your crib, as the corners are unforgiving. 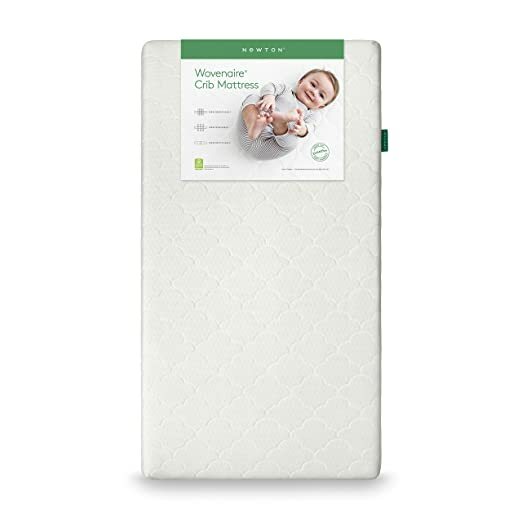 The Good: This mattress from Colgate is another fine choice if you are looking for a breathable, and comfortable crib mattress for your infant or toddler. The breathable cotton cover that comes with this mattress is also waterproof, which will help to protect the mattress from any stains that you might (will) come across. The Classica, which you can see here, is made to fit standard sized cribs and does so very well. When the mattress is put into a standard sized crib, there are no gaps or spaces, which will help to keep your little one as safe as possible. The Bad: Unlike some of the other mattresses on this list, the Classica is not waterproof or stain proof in its own right. You’ll always need to keep a cover on this mattress to make sure that no staining will occur. 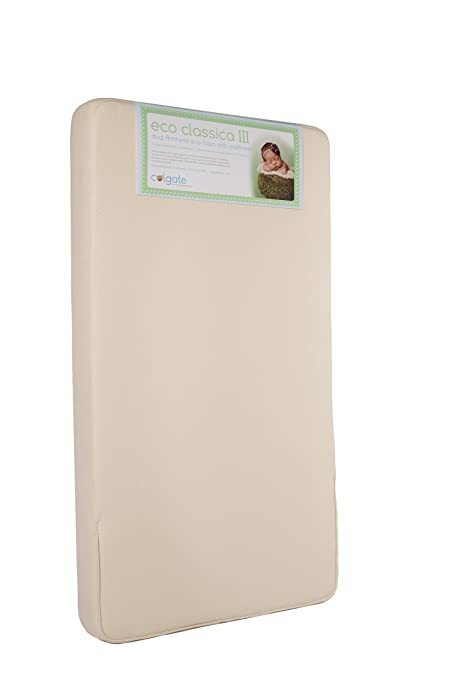 The Long and Short of It: The Classica is a simple, safe, and comfortable, breathable crib mattress. It fits snugly into standard sized cribs with ease. You’ll always have to keep it covered, however, as it is not stain or waterproof on its own. The Good: The Earth Breeze from Naturepedic has an innovative honeycomb design which allows plenty of air to flow through the mattress to your baby, making it completely breathable. This mattress, which you can view here, has a side for infants and a side for toddlers, which allows you to utilize it for a nice long time. This mattress also has an extra edge support system that is meant to keep your baby from slipping in between the mattress and the crib. This added safety feature is a nice touch, as it will help to keep your little one even safer than they would have been with the mattress’ snug fit alone. The Bad: While the innovative design of this mattress is pretty cool, you certainly will have to pay a premium for it. This mattress is about double the price of some of the other mattresses I looked at, making it a hard buy if you are on a tight budget. The Long and Short of It: The Earth Breeze’s innovative and breathable design make it a great choice for your baby’s crib. The price, however, might be hard to swallow if you’re on a tight budget. 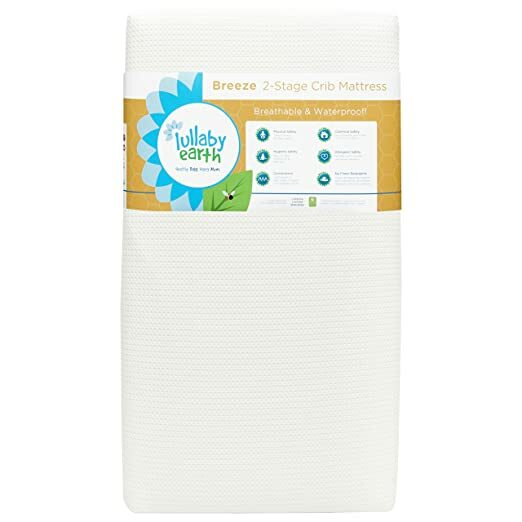 After lots of research and testing, I have concluded that the Newton Wovenaire Crib Mattress is the best breathable crib mattress out there today! It’s innovative, and safety-conscious design, coupled with its stress-free maintenance make it a great choice for your baby’s crib. I highly recommend that you check it out! A Chance To Breathe Easy! Ahhh, now doesn’t that feel good? Now you (and your baby) can rest easy because you know everything you need to to make sure you have the right mattress for your baby. Thank you very much for taking the time to read this article, and if you have any question, comments, or suggestions, please let me know in the comments section below. Have a great day!